Find out what Ocracoke's fisher folk are catching! Click here to read the local Fishing Report! Capt. Rob of the Schooner Windfall II could be sailing or chasing BBQ. Sometimes he interviews visiting sailors. Read all his stories here. 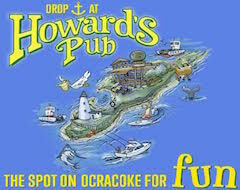 May is our peak spring fishing month on Ocracoke Island. Ocracoke's own Eduardo Chavez is among the culinary judges for the shrimp-cooking Seafood Throwdown cooking contest.